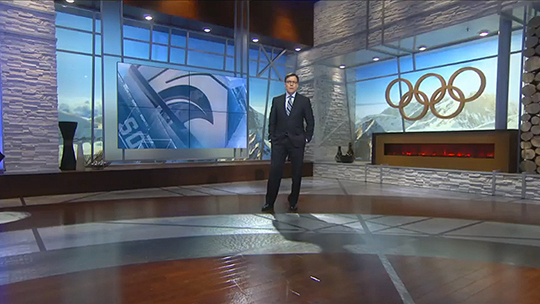 Scenic fabricator blackwalnut worked with Clickspring Design to construct two elaborate studios for NBC’s coverage of the 2014 Winter Olympics in Sochi, Russia. The sets, one measuring 3,600 square feet, the other 1,800 square feet, were built in upstate New York at blackwalnut’s facilities. For eight months, a technical design, project management and build team of carpenters, draftsmen, electricians, laminate and finishing specialists, painters, welders and 3D technicians worked on the technical drawings and construction of the sets from the company’s 44,000-square-foot fabrication facility. In November, the sets, akin to giant Lego sets, were divided into discrete sections for easy handling and then loaded onto nine shipping containers bound for Russia. blackwalnut’s team put them together inside the International Broadcast Center, located within the Olympic Village. Both high-definition sets are impressive, each of them containing two modular news desks and other design features worthy of the world’s premier sporting event. 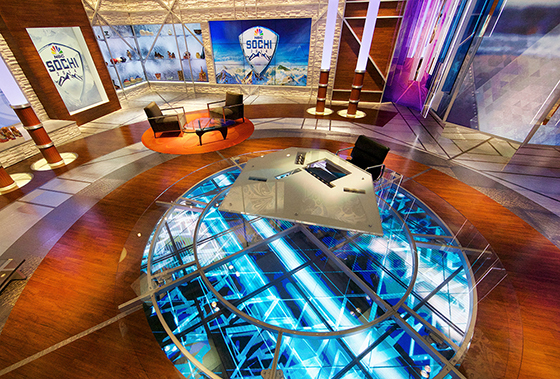 Studio A contains a 15-foot diameter live video floor, a triptic video screen that wraps around the entire set and an icefall in the background made out of Plexiglas. The set also includes thousands of feet of computer-controlled, color-changing LED lighting, a blackwalnut specialty. 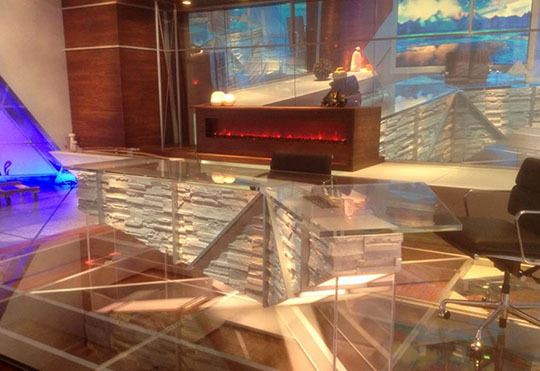 Over five tons of acrylic went into the construction of both sets to lend a flavor of ice and transparency to the environments, as well as bringing a winter-like atmosphere into the studios. The sets are clad in aluminum and steel, in addition to faux brick and high-end flooring and wall finishes. With more and more people set to watch the Games on their HDTV sets, the detailed process of fabrication and technical design is even more complex, said Managing Partner Jacob Gendelman. “With HDTV coming online in the last 10 years, this entire game has changed. Our work has shifted up-gear to some of the most high-end and demanding design and technical integration around, and in any industry,” explains Gendelman. “We’ve had to rethink the way we do everything from the ground up. It’s been an amazing experience, and it’s certainly never boring. With the explosion in LED technology, we’ve had to stay ahead of the curve and be ready to become experts in new tech on a dime,” he added. The company’s precision and attention to detail in fabricating clever, well-designed sets is known throughout the broadcast industry, said Mike Van Dusen, also a managing partner at blackwalnut. 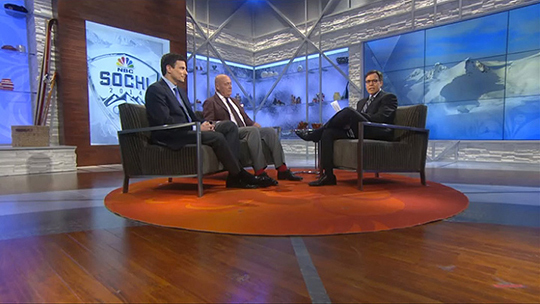 Stay with NewscastStudio for complete coverage of the 2014 Winter Olympics.